A big part of your job is ensuring your clients' pools function properly and don't fall into disrepair while they are away from their seasonal home. And that can be a big responsibility, considering the value of their pools! And while your current methods of following through with this task have worked for you up until now, there is a simple solution that can help you streamline your services! The HeaterReader™- a retrofit SMART WiFi device and App that lets pool owners program, control and monitor their swimming pool’s heater and pump from their computer or mobile device, anywhere in the world. But wait, how does this benefit you and your company?! The HeaterReader™ comes with one more amazing tool that is sure to help you save time, increase revenues and provide superior customer service - The HeaterReader™ Control Centre. The HeaterReader™ Control Centre lets you monitor multiple systems at once. 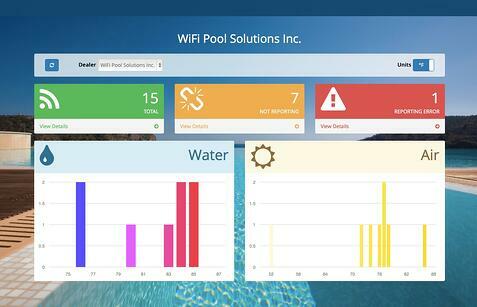 This means you can ensure that your clients' pools are running properly, with the click of a button. And, if it isn't, you will be the first to know, allowing you to resolve the problem before it becomes costly for you or your client. No more lengthy manual inspections or worrying about what could go wrong in between visits. Custom Schedules Set up to 12 schedules, per device to reduce your energy consumption and save money! Notifications You’ll know what is happening as it happens, from heater start up to heater failure. No more surprises! Heater didn’t fire when it was supposed to, a sensor failed or you lost your WiFi connection? You’ll know when it happens, in real time. Easy Install The HeaterReader™ easily connects to any swimming pool heater and pump. Plus there's no reason to tear up landscaping to run new electrical. Cost Analysis Our App tells you how much it is costing you to operate your heater so you can adjust your schedules and save more! And, if you are in a rental situation, you will be able to bill renters, more accurately, for their use of the swimming pool and pool heater! Retrofits to Any Pool The HeaterReader is designed for the retrofit pool market and can be easily installed on any indoor or outdoor pool heater and pump system. Anywhere Access Manage one or more HeaterReader's™ from anywhere in the world using our HeaterReader™ SMART mobile app or HeaterReader™ Control Centre! Manage Multiple Swimming Pools? We Have You Covered! Do you own a resort? A waterpark? Whatever the application, you are probably not in a position to have your systems malfunction - you depend on your pools to work so you can run a successful business! Well, the HeaterReader™ and HeaterReader™ Control Centre may be for you. In these commercial applications, the HeaterReader™ can help you monitor the state of your pools without having someone doing rounds to ensure that the heaters/pumps have turned on and continue to work. Simply login to your command centre and, in a quick glance, see the current state of things. And as a bonus, if something goes wrong with a swimming pools pump or heater, you will be notified instantly, allowing you to resolve the issue sooner than you could before. And while the need to maintain a consistent pool temperature is very important, you can set timers, using the scheduling function, to lower your heaters just a couple degrees in the evening, to reduce costs and water loss due to evaporation. And, with the cost analysis tool, you can watch the savings roll in!